Taking a break from roasting: Sick of squash? Me too! Here are two ideas to break up the root veg fest. Last night, I made dal for the first time, which is basically split lentils simmered until they get unbelievably creamy. There are a million versions online but I used Tara O’Brady’srecipe from her book, Seven Spoons, which calls for topping them with tarka, a mixture of butter-fried cumin and onions, plus tons of cilantro. It was earthy and comforting and exactly what we needed after an indulgent weekend. And tonight, we made Jessica Koslow’s Kabbouleh, a crunchy and addictive mix of chopped cauliflower, kale, herbs, vinegar-soaked currants, and—this is the secret—fried brown rice. Aside from the frying, it’s super simple and so, so good. Self-care scheduling: I’ve been giving this advice to a bunch of people in my life, including myself, so I may as well share here: Self-care is crucial, especially during times of transition (seasonal, life, etc.). Later this week, my friend Allidah and I taking ourselves to Heyday for facials (I have a monthly membership and I love it because it forces me to make time for my skin) followed by a ladies lunch at Locanda Verde, where I first discovered the magic of fresh sheep’s milk ricotta splooshed with olive oil and served with great bread. Listening on repeat: Rob introduced me to Brandi Carlile years ago and I love her voice and modern folky vibe. Her new album is gorgeous and will get in your brain—I’m hoping to see her live when she’s in town later this spring! Tasting our olive oils: We go through gallons of olive oil but it was’t until we listened to Carla Lalli Music talk about them on the latest Bon Appétit foodcast that it occurred to us to taste-test the stuff we use daily. We got out some bowls and spoons and went through our line-up—and thankfully they all passed muster. Fairway’s blend is our workhorse oil; it’s affordable and really mild, perfect for sautéing or pan-frying. Zoe’s has a cleaner, brighter taste and is now what I’ll use for salad dressings or sauces. We also have a Spanish finishing oil that is fresh and peppery, and perfect for drizzling on top of soups, crostinis, or desserts—and I’m planning on tracking down a bottle of Franci, which Lalli says is her fave. Adding to my tiny tong collection: A few years ago, Rob bought me a pair of tiny tongs for $1.50 at a restaurant supply store on the Bowery. They remain one of my favorite presents, and definitely the most frequently used. I’m requesting a few more pairs for my birthday—see, I’m easy to please! Feeling strongly about (baby) bodysuits: A couple of friends turned us on to H&M baby when Lilly was teeny and it continues to be our go-to for basics. They’re affordable, super soft, and cute but not cutesy (also I appreciate that there’s plenty of unisex stuff). We recently restocked Lilly on staples, including these amazing wrapover bodysuits—so much easier than over the head, and go with everything. 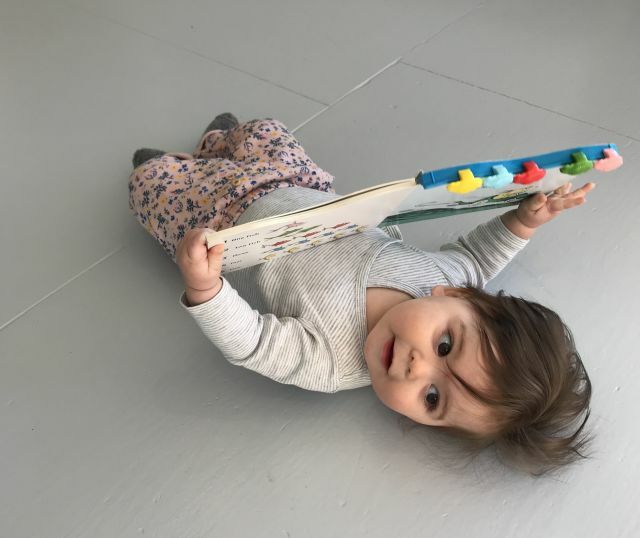 Raising a bookworm: Lilly is finally at the stage where she’s realized books aren’t just for chewing. This weekend we borrowed a friend’s place in Montauk and they were extremely well stocked with books, including this genius board book version of One Fish, Two Fish that was good for at least 15 minutes of solo entertainment. We also continued our Mo Willems Elephant & Piggie education—we definitely enjoy them as much, if not more, than she does. Rob says: I’m (finally) reading Bruce Springsteen’s memoir and enjoying riding a wave of mostly-Bruce listening. There’s something very special about diving deep into the human story behind music-making, followed by mainlining the actual music: live bootlegs; pre-fame demos; special editions; and the canon of albums—on vinyl or Spotify. It reminds me that music is not just a flash of inspiration, but the output of sustained hard work combined with perfectionism, egomania, self-doubt, and not a little delusion. Last thing! A few of you have asked about postnatal fitness. Big topic! I definitely don’t have things figured out—for one thing, my core muscles still don’t talk to each other like they used to, and I have no routine to speak of—but I do have some thoughts. One: Be nice to yourself. You birthed a human! Not only is your body different than it was, but your life and routine are also topsy-turvy. Two: Focus on the fundamentals, whether you’re six weeks or six months out. Rebuilding core strength—especially the deep core muscles—takes time and attention and unfortunately doesn’t deliver the same endorphins as a spin class. But I have been forcing myself to appreciate moves like cat-cow, bird dog, dead bug, and planks and they really do make a difference. Three: Just do it. Get moving in whatever way feels best to you, and that you do regularly. I can’t zip over to Equinox every morning like I used to so I squeeze in workouts where I can, even if it means doing a round of squats while holding Lilly (a squirmy 18-lb dumbbell!). Thanks for reading! Old newsletters live here.